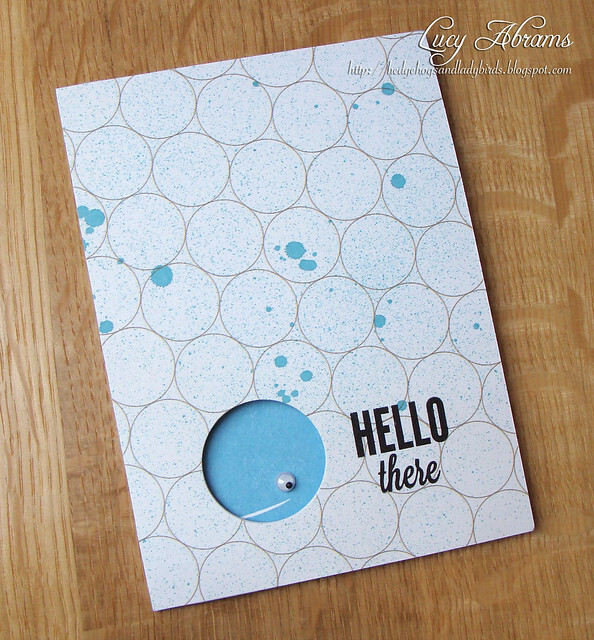 Lucy's Cards: Simon Says Stamp Blog Hop! Very cute peek-a-boos! Beautiful job! They're really cute but I especially love the cat in the box one....sweet! Love the peek a boo idea!! Really cute cards Lucy. I love the surprise that comes in each of them when you open them up. Have a wonderful Easter hun. Love the peek-a-boos! Thanks for sharing! oh! these are so fun and cute! Your cards are so funny. 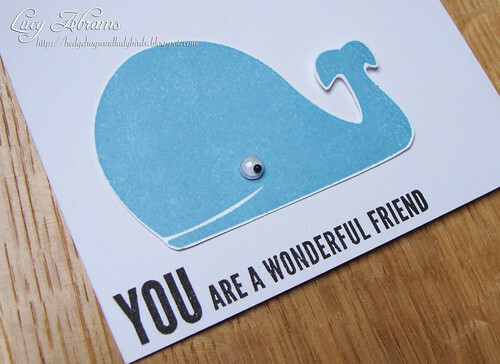 Okay that is OFFICIALLY the cutest whale card I have seen, ever!! the cards are so cute. tfs! Love the windows. Cute ideam!! Cute, clean, and simple! TFS! Both cards are so cute. Love the peek-a-boo aspect of them. What great cards...the little surprises inside are so cute! Amazing cards, I love that one with the whale, sooooo cute! Every Blog amazes me even more...love both of your cards! I adore both of these cards- way cute! Fun cards and super fun photos! Love the peek a boo idea Very cute! 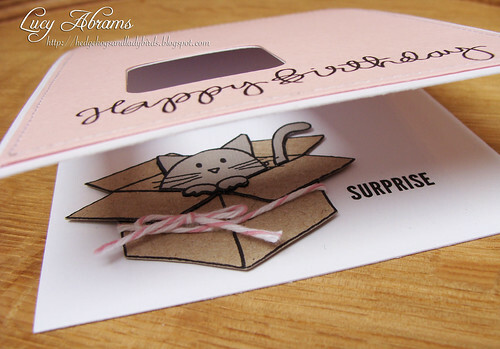 cute little kitty popping out from the box...adorable card! Very cute and clever cards with the peek-a-boo windows. I especially love that kitty in the box. He he, they are a lot of fun! Very clever indeed! Oh how I love your cards. The whale card is so creative and the kitty in the box is darling. I have to get some of these stamps and dies. Wow! So talented. You make me want to buy all those new products! Thanks so much for sharing. Such super cute cards Lucy!!! Thanks for sharing with us. Just lovely! Fun card with the whale eye. I loved both cards, so gorgeous!! Confratulations, nice work! Love how you had the inside peek out to the front - new inspiration, which you give me on a regular basis. Thanks, Lucy! I loved both cards they are gorgeous! Really nice work! Oh...beautiful...it's amazing how you have used such a class product. Always love the simplicity of your cards, Lucy! How cute! Love the peek-a-boo aspects of these cards. Thanks for the chance to win! How simple yet creative are those cards! Love 'em. Love these surprise cards! I'm always wondering how to create on the inside of the card as well. These cards provided much needed inspiration! Great peek-a-boo cards. Thanks for sharing. I love your sneak peak cards. Usually the front is the best part of a card. So to open up to the full image is a lovely surprise. Thanks for the inspiration. SOOOOO cute! Love both of these. Cute cards Lucy . Love the playfulness . Thank you for sharing. Beautiful card! I would like to recive this free package because I cant buy it in Croatia! Oh my! That's a cute whale peaking out! Totally adorable! Love the peaking kitty too! Omg your first card made me smile. That peek a boo whale is adorable. What a great idea--darling cards. Super cute cards, Lucy! I'm really loving the kitty card. Those are so cute! I love the kitty in the box, I think I need that set. Those are such cute cards! SO adorable!! LOVE them both! Thanks for sharing and for the inspiration! I never get tired of peek-a-boo cards! Oh, my sweetness. Your cards are just too cute!! Love 'em!! Both are adorable...love the kitty one!!! Peek a boo cards are one of my favorite to make. They are so much fun and yours turned out so cute. Both the cards are adorable!!!!! Love how you played with the windows and made them adorable, fun cards! LOVE your cards! I think I need to get that whale - so cute! Great card ideas! I love the cat in the box! I love all the new products...can't wait to get my hands on some of these!!!! Would love to have it ALL!!!! lol Thanks for sharing. I visit your blog regularly for inspiration. Love your style! Thanks for the chance to win! That peekaboo technique is really charming -- thanks for the idea. I can't wait to try it. Oh my goodness.that whale card is adorable!!! Love it, thanks so much for the inspiration. Both of these cards are so adorable, they make me smile! YAY, new SSS exclusives! Love them. These are both super cute cards! Love that kitty in the cardboard box! Adorable! 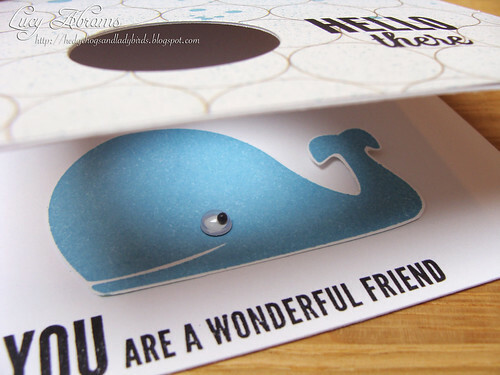 Such a cute cards.. Love the whale peeking..
the windows on the cards are such a great idea! These are fabulous! Super great ideas! So adorable! Love the surprise under the window. Your cards are so cute, Lucy! cute cards! I like both so much I couldn't even pick a favorite! I just love your cards. The whale one is just perfect for a baby card. Tks for the great inspiration. I love how the cards are interactive with the inside, such a lovely element. Very nice cards, makes me wanna create. Inspiring! I LOVE the whale card! Not only is it cute that it's peeking through the hole, but that it's got a googly eye, too! Super fab cards, such fun! I really like the window on both cards. I am gonna have to try that soon! Thanks for the inspiration. I would laugh so much if I was the person to receive the whale card! So cute! Thanks for sharing your ideas. The critters are quite cute. I especially like the whale! I love your combo of PP with that whale. Overlooked the wiggly eye at first - what a fun surprise. What lovely Peek Through cards! Totally love it. Gonna try it soon. Thanks for the inspiration. sweet, sweet cards with your critters poking thru! I just can't help but smile when I see that cute little kitty. Great cards and thanks for the chance to win. Very Cute! I love the peek-a-boo's in your cards!! Fabulous cards! I loove the one with the whale =) TFS! These are adorable, Lucy! How cute that the whale is peeking through the hole :) and loving the kitty - such soft pink and brown colors! OH MY, I love the whale eye peeking through the card! Be still my heart...thanks for sharing! OMG I LOVE that whale, and the cat in box is just so cute. Thanks for giving a lot of inspiration! Will follow your blog! Love those designs when you first get only a peek and you have to open to see the whole picture... Very clever! Love those cards! So gorgeous! Love those peek a boo cards. So clever, and lots of fun - thanks! Your whale card is too cute! Cute cards, Lucy! Thanks for the chance to win! LOVE all those new products! I love these cards. Great set. I hope I get this set. 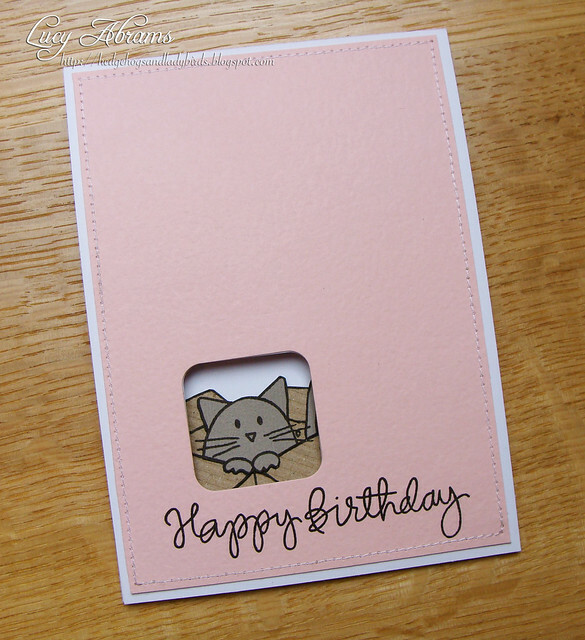 The Happy Birthday card is such a cute idea - makes for an adorable card. Great cards I love the cards they are awesome. these totally make me smile. Love the whale card! So Stinkin' Cute! I like these cards, what a great idea! Love your cards! They are so fun. Great cards. Love your ideas!! I am loving this peek a boo trend, just makes me giggly happy! I love your cards! You did a fantastic job! Thanks! Love how you put the main focus inside the card!! Oh, my goodness! Your peek-a-boo cards are the best! The recipients of these cards would say AAAW just like I did. Thesy're both adorable. Love the surprise element on the cards! So fun! So very cute! Love the texture of the kraft cardstock you used, it gives a realistic look to the box. Oh my goodness, the whale is brilliant! So much fun. And the kitty peeking through is adorable - definitely coming home to me! The peek-a-boo whale is fantastic!! Great cards! thanks for opportunity to win! These are adorable! I especially love the whale because you don't necessarily know he is a whale until you open it. Too cute! Very fun cards, love the peek-a-boo look. Thanks for the opportunity to win. Love the cute peek a boo whale. What a wonderful idea I will have to try this. Love these cards, so darn cute! Thanks for sharing. Very clever cards, don't you just love a surprise! Thanks for sharing. Soo cute cards!!! Loved them!! I love these window cards, I never know what to use a window for, but these guys are the cutest thing! Adorable cards. All of them. Oh these are the cutest most adorable cards ever!! I am absolutely loving all of these peek-a-boo cards! Yours are just adorable! Love them all! Thanks for the chance to win! Awesome ideas…thank you for the inspirations! I love that kitty in the box stamp too! Thanks for a chance to win! Fantastic peek a boo cards Lucy ! Your whale card is especially brilliant ! I love how his eye just pokes through the hole ! 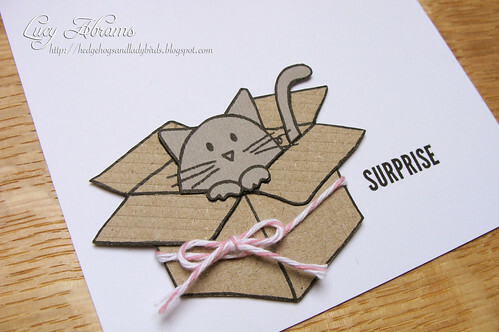 I adore that cute cat in a box - I've got to get that stamp! Adorable. Love the peerk-a-boo cards. I just love this whale stamp! your surprises in the middle are adorable!! and fun! The whale peeking through really appeals to me. Well done. Great job on those pee-a-boo cards. I love both of them. Hi Lucy! Love your window cards here, and though I'm not a cat lover, the 2nd card is just darling! Love your little "surprise" cards! Especially the whale one! Too cute! What fun peek a boo cards!! TFS! !